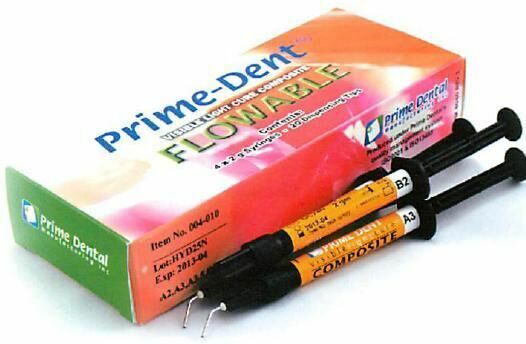 Highly polishable, 67% filled, esthetic composite used for all types of cavity preparations. Ideal choice for anterior and posterior applications as well as use as a pit and fissure sealant. also ideal for reparing small defects and filling in cervical gaps caused by toothbrush erosion and recording gums. Also used to eliminate undercuts prior to taking impressions for composite inlays and to line cavities and fill in difficult access areas prior to placing condensable composites. Easy to polish to high luster. Has high compressive strength as well as low shrinkage and resist wear and staining. Radiopaque for easy identification in radiographs. The micro-hybrid formula provides strength and polishability. Fast, deep light activation in only 30 seconds for lighter. shades & 40 seconds for darker shades. High compressive strength 290 MPa.